Now, this may seem like a very simple thing, and indeed it is, but I had wondered for years how to get that nice, runny yolk so that I could place the egg on top of a salad, break it open and let that gorgeous, rich yolk run all over. Perhaps you have too. I poach eggs all the time for breakfast, but this is something all together different. Gently simmered in the shell, for just long enough to form a solid white, the yolk starts to come together, but is left very much liquid. The result is something magical that adds a richness to salads, is perfect over toast or on its own with just a sprinkling of salt. Bring a small pot of water to a bare simmer. Lower the eggs into the pot gently with a slotted spoon. You can cook as many eggs as will fit in the pot in one layer. As soon as you see the first bubble come up as the water returns to a simmer, start timing. Five minutes was perfect for my rather large eggs, but if you have smaller eggs, or if you're cooking a lot at once, start taking them out a bit sooner. Immediately plunge the eggs into cold water and let the water run over them until the eggs are cool, to ensure they have stopped cooking. Peel the eggs, very gingerly, and serve as desired. I've loved soft cooked eggs since I was a small child. My father was famous for them. He served them on salads, pastas and crackers. My favorite way was in my own little egg cup, served with toast points. I don't know that I have ever had a soft cooked egg! Looks/sounds yummy though. Beautiful pic! 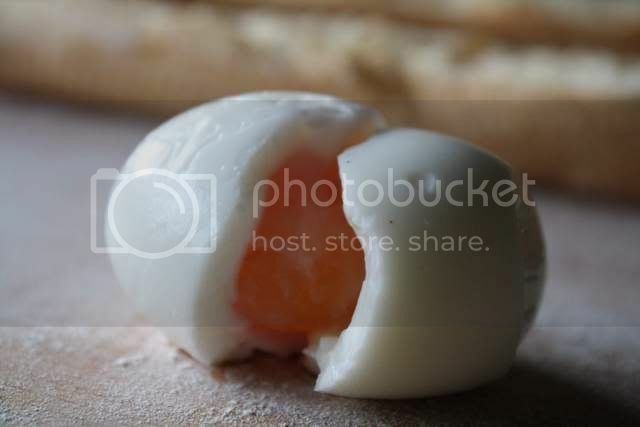 Love soft boiled eggs. My grandmother always made them. New to your blog—looks lovely! Love the photo!! I never eat soft boiled eggs, I will have to give them a try! Looks delicious. I sure wish I could still eat eggs...darn allergies. The basics are very important! My favorite way to make the perfect soft boiled egg is to bring the water to a boil with the eggs (in one layer) in it. When the water starts to boil, I immediately take the pot off the heat and cover it for 3 minutes before taking out the eggs and plunging them in cold water. Looks delicious! For a different texture altogether try cooking an egg at 160 degrees F for 45 minutes. It's hard to maintain the temperature but the resulting custardy egg is totally worth it. I make hard boiled eggs all the time, but have never tried soft boiled eggs. I'm impressed that you got it peeled so cleanly, I always have trouble with that! Love the site! Great writing and photos. I can never tell when the water "starts to boil" or whatever. So, I get the water to a boil, put the eggs in a steamer basket, and cover - 6 1/2 minutes later (7 for my spouse) and into the cold water they go - right every time..